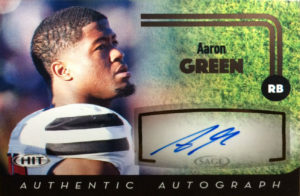 Aaron Green played at TCU and while he set the NCAA on fire with 7.1 YPC on 129 carries and earned Second Team All Big 12 in 2014. His numbers increased to 1,272 yards on 244 carries, but because of a bevy or RB talent in the conference, he only received Honorable Mention. Considered undersized at 5’10, 203, scouts were not impressed with Green, and he went undrafted. Aaron signed with the St. Louis Rams after the 2016 NFL draft. He made the squad in part to his hard running during the preseason. With Todd Gurley resting, Green logged 23 carries for 111 yards and a TD. He also displayed some handiness in the passing game catching 9 receptions for 76 receiving yards and another TD in only 3 preseason games. Aaron was released during final cuts, but quickly assigned to the practice squad. With a loggerjam at runningback heading into the 2017 season, Aaron was released in May. Currently he’s a free agent.